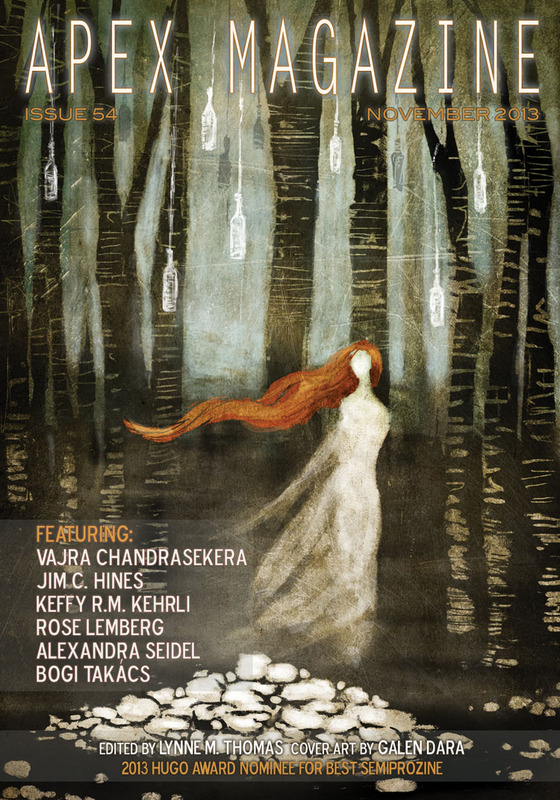 Apex Magazine is a monthly science fiction, fantasy, and horror magazine featuring original, mind-bending short fiction from many of the top pros of the field. New issues are released the first Tuesday of every month. A 2013 Hugo Award nominee for Best Semiprozine! Cover art by Galen Dara. Galen Dara has done illustrations for Fireside Magazine, Lightpseed Magazine, The Lovecraft eZine, Scapezine, Apex Magazine, Dagan Books, and Edge Publishing. Most recently she has illustrated the cover of Glitter & Mayhem, edited by John Klima, Lynne M. Thomas, and Michael Damian Thomas, and the cover of War Stories, edited by Jaym Gates and Andrew Liptak. When Galen is not working on a project you can find her on the edge of the Sonoran Desert, climbing mountains and hanging out with a loving assortment of human and animal companions. Her website is www.galendara.com and you can follow her on twitter @galendara.